‘No one is more beautiful than you at your best’ ‘ Howard Murad. Now that’s an inspirational quote we can get behind! One of the new skincare brands we have on our website is Murad and they have plenty of products to really up your skincare game! Murad was founded by Dr. Murad in 1989, he had a desire to help people look and feel younger and healthier. His solution driven skincare products have ground breaking formulas that he has perfected over the years. As well as many of the products receiving numerous awards, Dr. Murad himself has been awarded ‘the Aesthetic Visionary Award for Lifetime Achievement’ by Vogue magazine and ‘A Beauty Genius’ by Elle magazine. 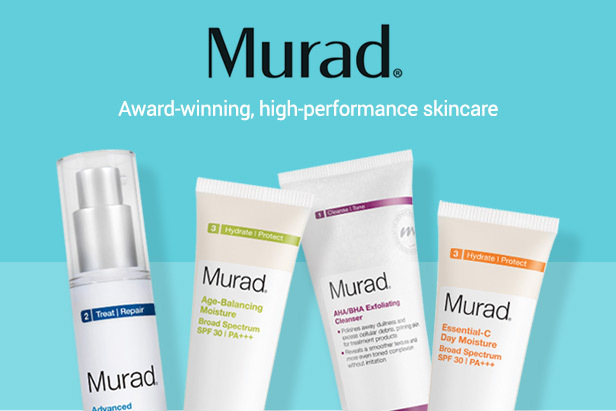 Many of the Murad products sit under 1 of 3 categories ‘Cleanse | Tone’, ‘Treat | Repair’ or ‘Hydrate | Protect’. For cleansing and toning Murad recommends you wash your face twice daily to remove dirt, debris, makeup, dead skin cells and accumulated oils. Use a toner no more than twice a day to restore skin’s pH and prepare it for the next step. There are a number of different cleansers and toners in the range that you can choose from to suit your individual skin type. For example Blemish Cleanser, Clarifying Cleanser, Exfoliating Age Reform Cleanser. For treating and repairing Murad believes this to be the most important step of everyday skincare regimes. Use to repair existing damage and optimise the health of your skin so that it can defend itself against further damage. These products include Radiance Peels, Smoothing Polish and Firming masks that will deal with any skin issues you may have. Finally there is hydrating and protecting the skin. Murad highly recommends using a sunscreen every day, regardless of your activities or the weather. Also apply a moisturiser morning and evening to replenish and restore your skin’s surface. Many of the Murad day cream moisturisers include an SPF in them. Invisiblur Perfecting Shield. This award winning protecting shield with SPF 30 is a serum that instantly blurs skin imperfections whilst also protecting from the sun. It’s the perfect makeup base! Age Reform Starter Set ‘ Beautiful Start. This is perfect for all Murad beginners as it includes a refreshing cleanser, perfecting day cream, rapid collagen infusion and a hydro-dynamin ultimate moisture for eyes. Hydrating Toner Resurgence. This toner is so easy to use as it comes in a spray bottle, if you don’t usually use a toner this is a great one to start with! It balances, hydrates and neutralises the surface of the skin.